10 Essentials of "Proper Juicing"
1. Keep vegetables and fruits separated as a general rule. Apples are OK with vegetables but in most other cases do not use both food types in the same drink and separate the eating of the two by about 30 minutes. 2. Make it a priority to absorb the vast majority of your raw vegetables by juicing them in order to maximize the nutrition you take in and to access more nutrients. 3. Fresh raw vegetables - Juiced - will result in accessing more nutrients than by any other means. Juice 2 to 3 times a day and eating one large salad is ideal. However, juicing once a day 4+ days a week would be beneficial. 4. Preserve the life force of raw foods by juicing or eating the majority of them raw for your greater benefit and your greatest wellness. 5. Juice consistently through the week for the best nutrition and rewarding results. Shoot for a minimum of 65% of your diet being raw foods juiced or eaten with 85% being ideal for the very best results. 6. 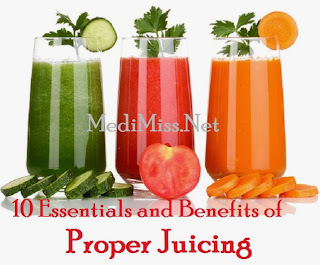 Develop a consistent juicing routine that works best for you - the benefits are well worth the changes this may require. 7. Be as careful as you can to get the best quality Food and Juice your budget will allow. This will determine the quality and quantity of juice you get and drink. 8. Focus on Vegetable Juicing, drinking the rainbow of colors displayed throughout the whole wide world of vegetables. 9. Take a minimum of 9 days on a consistent juicing routine mixed with some cooked and some raw food. Enjoy the results! 10. When storing fresh juice do it immediately, fill it FULL, seal it tightly and refrigerate or freeze right away! 1. A much easier way to acquire the recommended daily requirements of fruits and vegetables for our best health and greatest wellness. 6. Removes stress from your digestive system - Removes Stress, Period. 9. Oops - one side effect - great weight control, oh, and lots of people reporting lost symptoms of previous problems - oh well... those we can live with! 10. Greater energy will be yours within days of consistently juicing - Try it! 11. The energy you gain is natural not induced by stimulants you can't pronounce. Take your own energy drink to work with you for a power packed day! 12. A renewed quality of life by feeling a lot better than you have for a long time! 13. It's easy: buy some fruits, clean, cut and place in your extractor then enjoy drinking the juice and clean-up! 17. Many report healing from cancer, heart problems, diabetes, leaky gut, better eye health and a whole host of other issues. What will your results be?